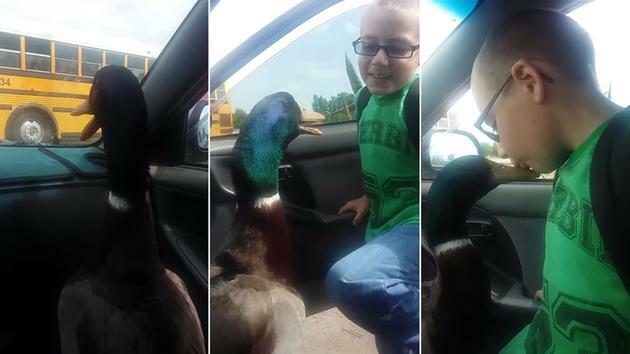 This Duck Waits In The Car For His Little Human. The Duck’s Reaction When He Arrives? Priceless! Nibbles waits patiently in the the front seat of the family car. He is highly alert and on the lookout for the big yellow bus that drops off his best friend at the end of their long driveway. When the school bus comes rumbling down the street, and rolls to a stop in front of the car, Nibbles perks up and begins to get excited. Finally, he sees Jonny get off of the bus and walk towards him. The sight of his best friend causes Nibbles to instantly let out a series of the cutest, most happy, and delighted sounding quacks anyone’s ever heard. Quacks? Yes, you read that right, Nibbles is a duck, not the conventional dog that you may have imagined. He is a Rouen breed duck, which is a domesticated type that sport beautiful emerald green colored heads with white collared necks. When he was young and not yet hatched his mother passed away. That was when the Toschi family adopted him and taught the young duckling how to wear ducky diapers. That way, he can do what he loves best, spending time indoors with his family and accompanying them on car rides. Nibbles and 10 year old Jonny have since formed a mutual, close, and special bond with each other. That is clear to see when Jonny gets in the car and plants a series of sweet kisses on the top of his feathered friends head. It’s an adorable and heart warming moment that is sure to make you smile. Forget about a boy and his dog, this story belongs to a boy and his duck.